SYNOPSIS: Pretty, flirtatious, and ambitious. Nan Bassett hopes that an appointment at the court of King Henry VIII will bring her a grand marriage. But soon after she becomes a maid of honor to Queen Jane, the queen dies in childbirth. As the court plunges into mourning, Nan sets her sights on the greatest match in the land...for the king has noticed her. After all, it wouldn't be the first time King Henry has chosen to wed a maid of honor. And in newly Protestant England, where plots to restore the old religion abound, Nan may be the only one who can reassure a suspicious king of her family's loyalty. But the favor of a king can be dangerous and chancy, not just for Nan, but for her family as well...and passionate Nan is guarding a secret, one that could put her future -- and her life -- in grave jeopardy should anyone discover the truth. this sounds like a good book. i do love the tudor period. I enjoyed her last novel. It was close to fluff but thats OK for me. Sometimes I need to read that kind of stuff. My review is up at The Burton Review.. and reading this one, I must say it did not remind me of fluff, though I understand the viewpoint from reading her last one, which I also enjoyed. I really enjoyed it. Sounds like another good Tudor intrigue! I just started watching Season 3 of the Tudors last night. This sounds like it will be a great book. 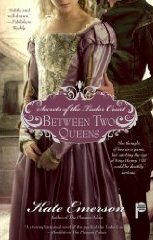 It will be nice to read a book set in the Tudor Era without having it be about Anne Boleyn. Thanks for the tip.